We just got back from a little trip to Disneyland. I will be posting some tips and tricks for you soon but first and foremost let’s get down to the important business on any vacation, the food. Normally you wouldn’t even think of a theme park as having good food. It is typically cotton candy, greasy burgers… nothing appetizing for sure. But Disney? Oh no my friends. 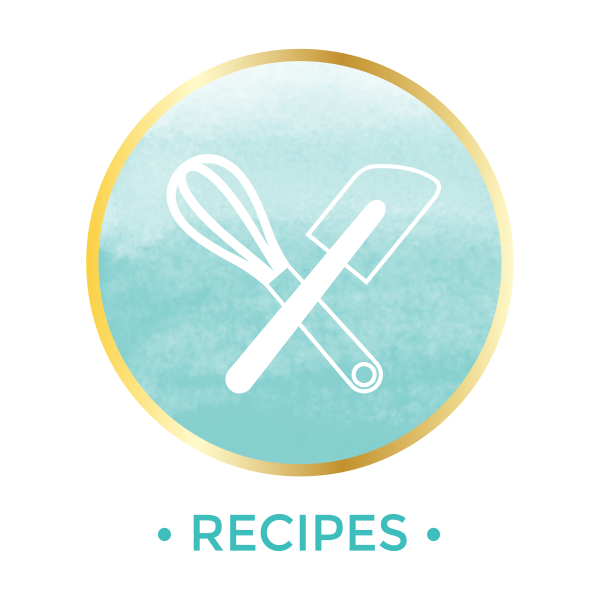 There are so many wonderful things to try! Don’t cheat yourself out of the treasures that can be found. 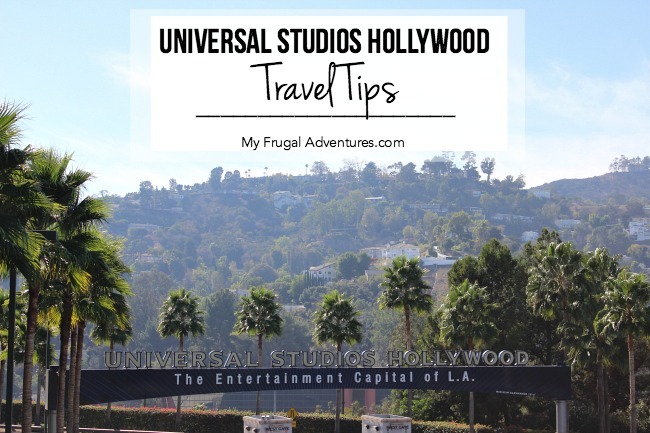 There are so many wonderful foods- I had to include some staples like the Dole Whip- but I also sampled quite a bit on our trip and asked friends and cast members at Disney what their favorites are in an attempt to really find the highlights from the park. 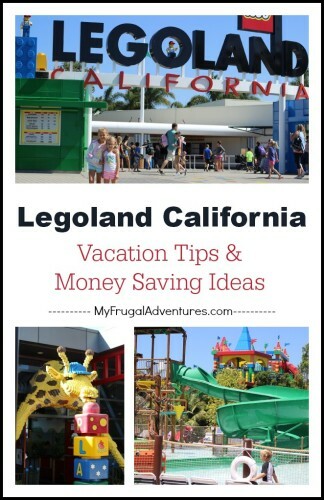 So here are 10 of our personal favorites from Disney and California Adventure. I would love to hear in the comments what your personal favorites are! 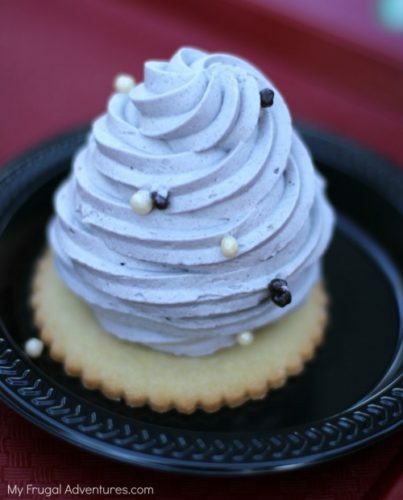 This is a limited time treat found in Fantasyland at the Red Rose Tavern* (formerly Village Haus). It looks disgusting but I have to say we loved this treat. Thumbs up from all family members. It is a shortbread cookie (my least favorite part), a cream cheese frosting and under that grey stuff is a red velvet cupcake. I do not care for red velvet at all but this was just delicious. They also have a lemon rose cake with a lemon mousse and strawberry rose filling. We thought this was not great. In fact only one person in our family would eat it BUT it is lovely. And PS: the pizza and burgers that others were ordering when we picked up dessert looked fantastic. *Red Rose Tavern is in support of the new Beauty and the Beast movie and a limited time promotional thing. The cute little corn dog truck in Disneyland is always a favorite for us. The kids love these freshly dipped corn dogs- they come with a side of chips or apple slices. Save yourself a little cash by skipping the side. Sadly the truck gets swarmed around dinner time – the line was 25 people deep when we stopped by around 6pm so keep that in mind. Basically every single item at Pooh’s Corner is my favorite. You can find many of the items in other spots around the park or at California Adventure. 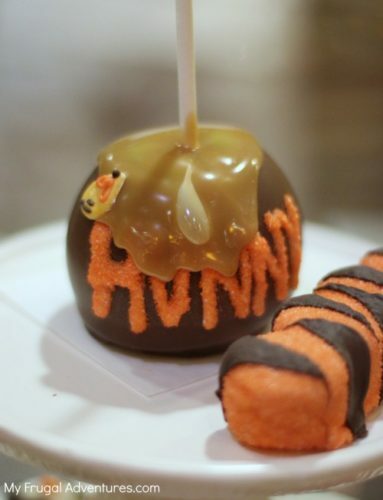 Pooh’s Corner is my very favorite though because they seem to have some unique items like this darling Pooh caramel apple and Tigger’s tail. You can watch them making the treats and these are fantastic items to take home with you. 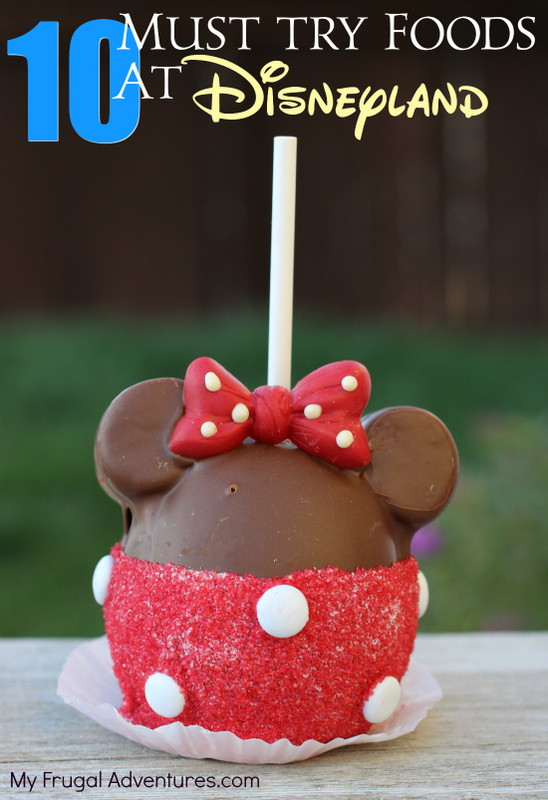 We wound up taking home a Minnie caramel apple (delicious!!) – they will cut that into slices for you. The big fluffy cookies are SO VERY GOOD. This time around I grabbed a peanut butter chocolate chip cookie and yum! A great treat to bring home for house sitters and dog sitters and grandparents and teachers and such. Honorable mention here goes to the darling marshmallows – I mean these caterpillars are the cutest thing ever. 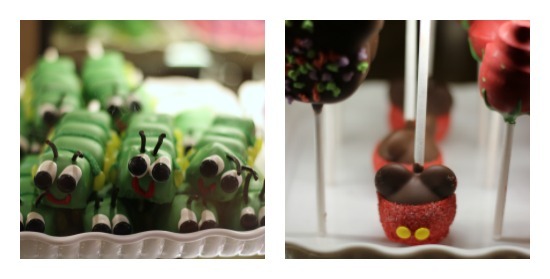 And the cake pops are darling… You just can’t go wrong with anything and everything at Pooh’s Corner. This sounded so darn good! The stuffed bacon, sour cream and butter baked potato at Troubador Tavern right in front of Toon Town sounded so good! This was recommended a few times but sadly I went by twice and both times the tavern was closed. Bah! I hope you get lucky and score a yummy potato on your trip. A fantastic stop when you are ready to give your feet a break and cool off. Cafe Orleans is a sit down spot (reservations recommended) with a few delicious and decadent items. The first and the best is the amazing beignets. Amazing! You can also get beignets in Downtown Disney and these are my number 1 must have treat at Disney. The ones in Cafe Orleans are shaped like Mickey and come with two delicious sauces – a fruit coulis and creme anglais. You might also try the Monte Cristo sandwich and the amazing pommes frites. 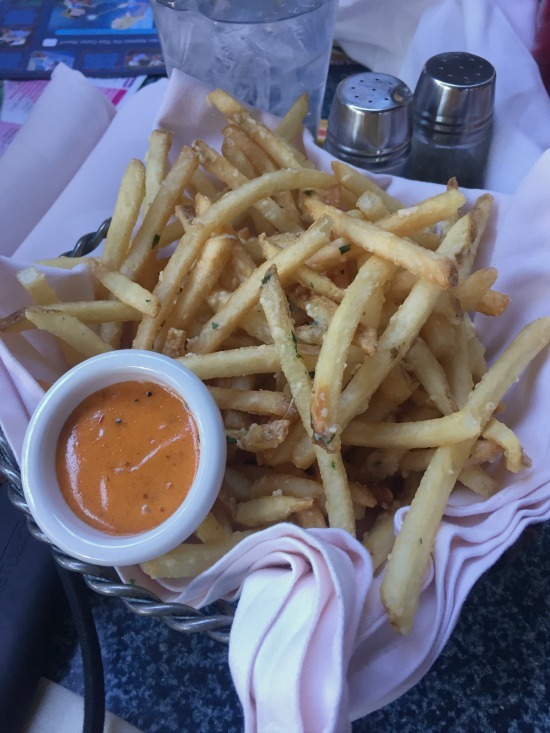 These are a parmesan cheese and herb thin cut fry with a delicious sauce. Everything we have had at Cafe Orleans has been delish. The churro carts are all over the place and smell heavenly. 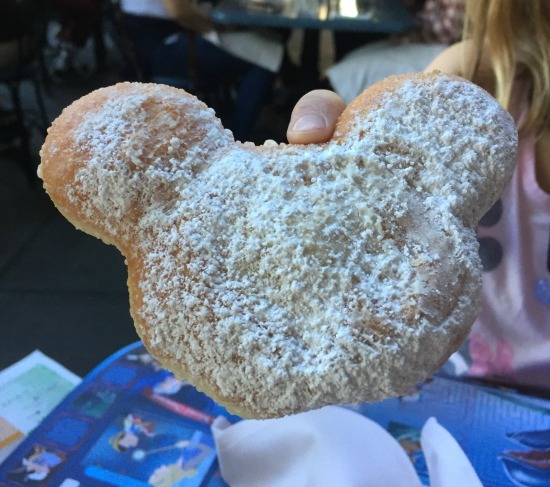 There are a handful of carts though that carry specialty items like flavored churros, churros with dipping sauces and churro ice cream sandwiches. Live and little and try a flavored churro- during our stay there was Gingerbread, lemon, apple cinnamon and cookies and cream varieties. I also saw a churro with nutella dipping sauce that sounded incredible. 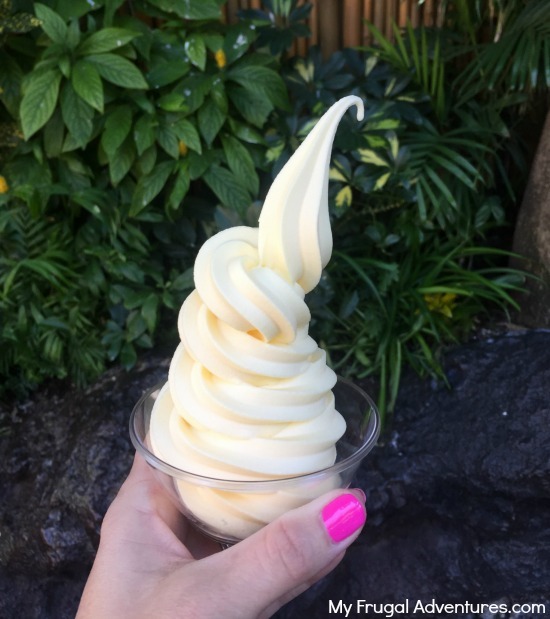 Have you tried a dole whip? It is pineapple soft serve and incredibly yummy. Get one like ours pictured above or in pineapple juice (I was rooting for that one but my family are purists.) Pick one up in the Tiki Bar in Disneyland. Pretty much everything at the Cozy Cone Motel by Radiator Springs is a winner. 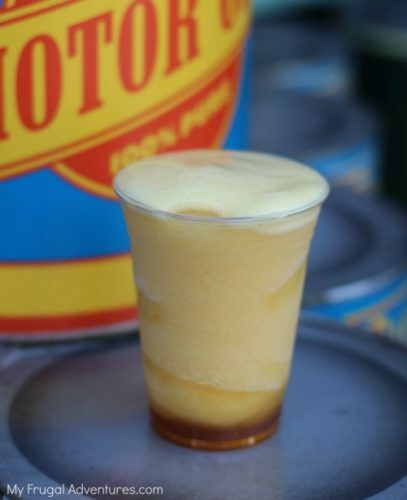 Our favorite thing at CA Adventure was this Apple Freeze drink. It is a delicious concentrated apple slush that is fabulous in the afternoon when you need a little sugar rush. The Cheddar Garlic Twists also looked amazing or try the flavored popcorns or Chili Cone Queso in a bread cone. Yum! Brioche French Toast with Salted Caramel and Bananas. This bowl of yum is available at Flo’s V8 Cafe as breakfast only (served until 11am). Sadly we missed this because during our visit the park opened at 10am and no way was I spending the first hour in the park eating. I was super bummed to have missed this and I have heard raves about it. Next time Flo’s! You and I have a date. You can’t go wrong with ice cream at California Adventure. Choose from Clarabelle’s with hand dipped ice cream bars or sundaes or head over to Ghiradelli’s for over the top sundaes. 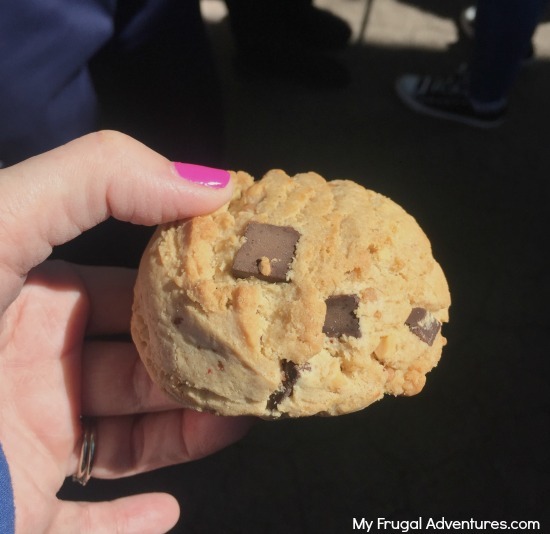 We have been to Ghiradelli’s many times and decided to try Clarabelle’s this go around. 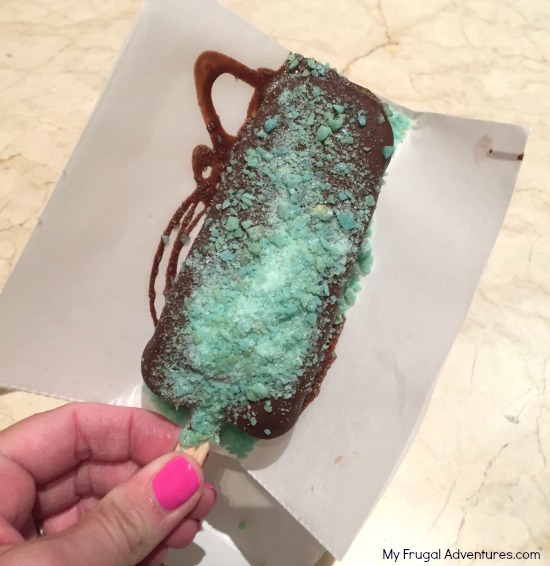 We had a delish hand dipped ice cream bar with pop rocks (!) on top. It was gone in a second and the kids were licking the wrapper. (Or maybe it was me. Stop judging.) The ice cream sundaes come in the most adorable little souvenir cups- if you have room those look pretty heavenly. And that is about it for our favorites. Lots of treats for sure so I made sure to pack a lot of healthy snacks and water to balance out all those sweets. 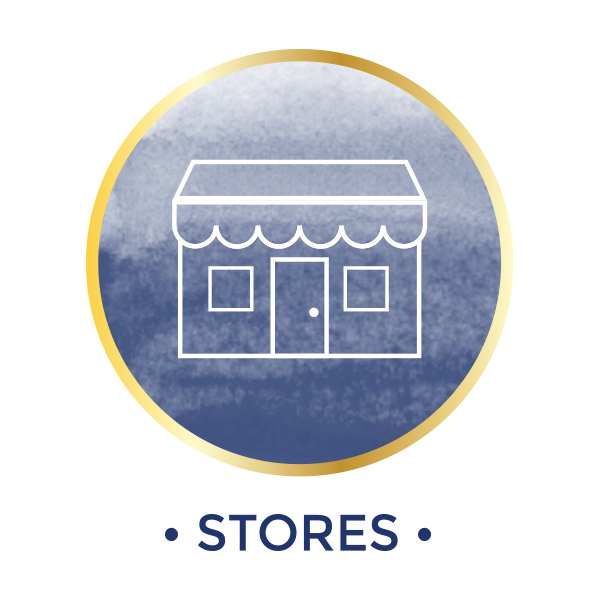 If you have any favorites from Disneyland or California Adventure or Downtown Disney, please let us know in the comments below! I love the Dole Whips! THey are the perfect way to cool off on a hot summer day! Did you try the lemon rose cake? With the grey stuff! 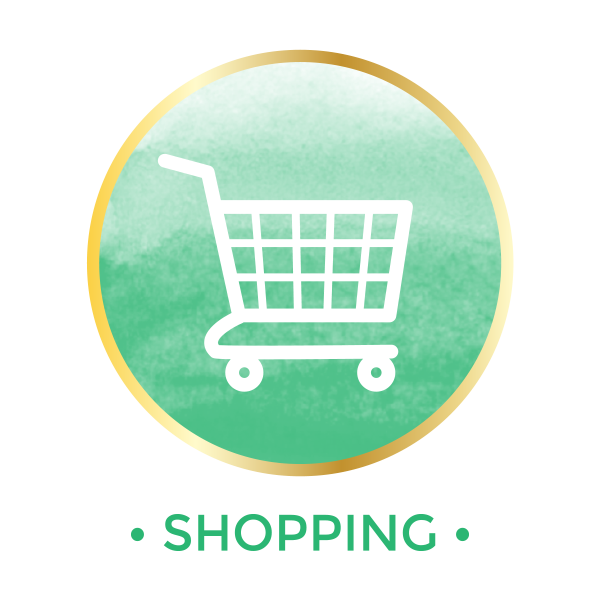 Also …. I think I need to make some apples ! Seriously – no turkey legs? They are so messy but so yummy. I also love to get a “virgin” mint julep in New Orleans square. Hi Jen, I have heard the turkey legs are great but they look really messy and weren’t appetizing to us. Lots of others love them though and I did see quite a few people walking around with them. 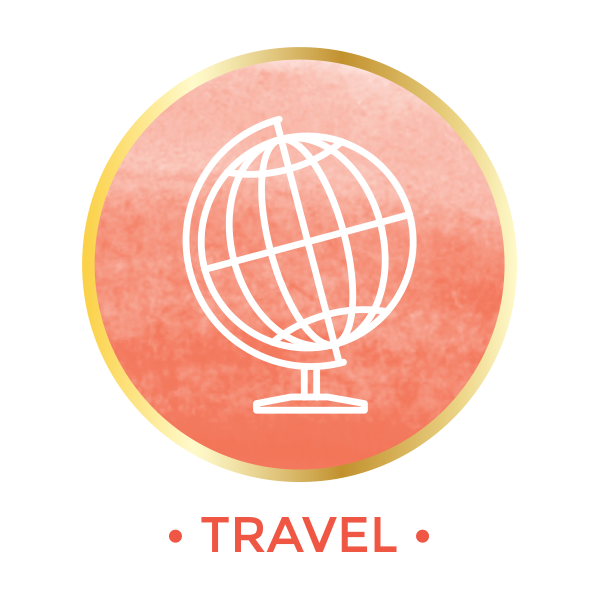 Hi, I’m planning a first time visit to Disney wold with family (kids are 5 and 3 years old). Do you have any post with tips? I’d really appreciate it! Your right, everything at Disneyland is amazing. Our family favorites include the big turkey leg that my husband has always shared with the kids. The churro (no matter how full you are). For me its the Dole Whip. I need one all to myself, no sharing with that, lol. In CA, we have these frozen yogurt shops, I believe called Menchie’s and they carry a pineapple version of yogurt that is pretty darn close to Disneyland variety. I bring it home and top it with cold pineapple juice for a summertime bliss. Hi Lorena, Lots of people love those turkey legs :). Yes we have Menchie’s and OMG Yogurt that carry the Dole Whip now and I think it is super close too. We randomly found Dole Whip in Maui at Hilo Hatties too. I am working on a pineapple sorbet recipe with fresh fruit to post on the blog. It is in the fridge right now for recipe testing. Hi Charlene, do you have pin it button for this post? Hi Tatyana, thanks for noticing. I need to build one this afternoon. Sorry about that! 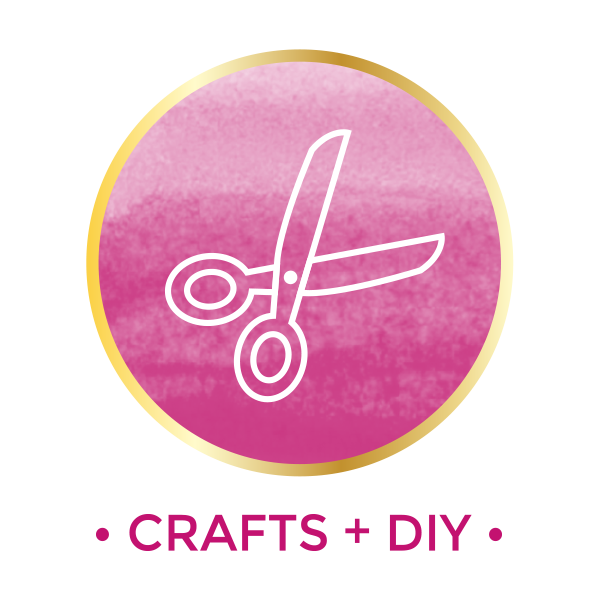 Here is my pin if you want to repin. Churros will always be the best snack at Disneyland for me.